On February 3, 2019 many Posts throughout the Department of Virginia held Four Chaplains Memorial Services. The Four Chaplains, also sometimes referred to as the “Immortal Chaplains” or the “Dorchester Chaplains”, were four United States Army chaplains who gave their lives to save other civilian and military personnel as the troop ship SS Dorchester sank on February 3, 1943, during World War II. As soldiers rushed to lifeboats, Reverend George Fox (Methodist), Jewish Rabbi Alexander Goode, Reverend Clark Poling (Dutch Reformed) and Father John Washington (Roman Catholic) comforted the wounded and directed others to safety. One survivor watched the chaplains distribute life jackets, and when they ran out, they removed theirs and gave them to four young men. As the Dorchester sank, the chaplains were seen linked arm in arm, praying. 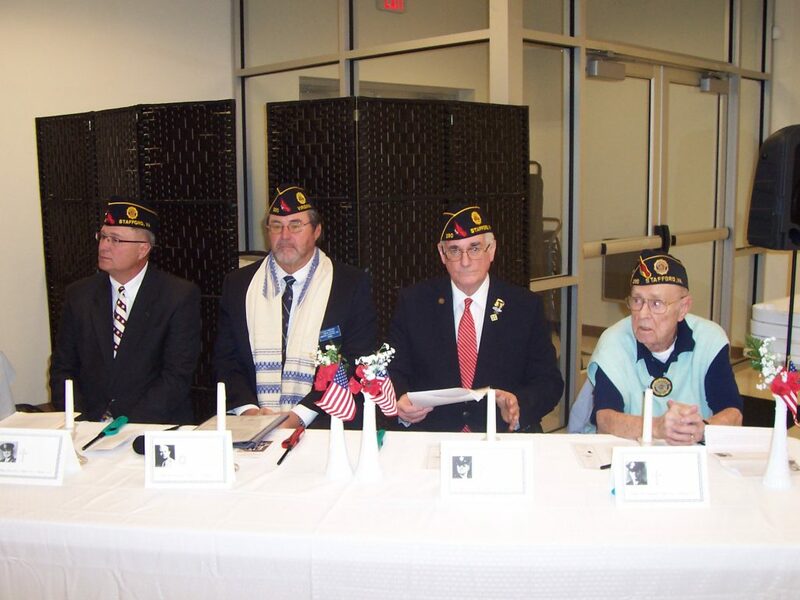 Legionnaires Dan Dietze, Steve Robertson, Bob Ponzo, and Mickey Collis (pictured left to right) ready to read each Chaplains memory. Legionnaires Dan Dietze, Steve Robertson, Bob Ponzo and Mickey Collins were selected for the honor of reading each Chaplains memory. Each of the individuals selected were of the same faith as the Immortal Chaplains and performed their duties well. 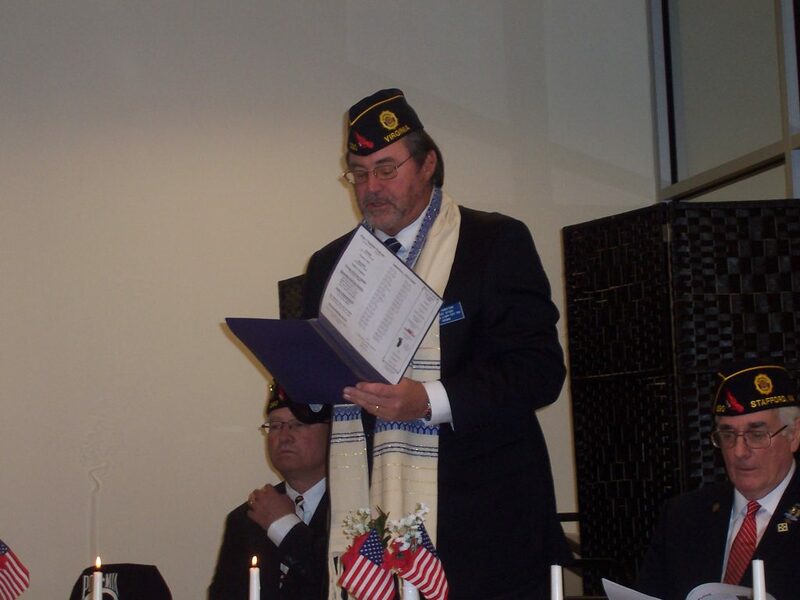 Legionnaire Steve Robertson proudly wearing his tallit (prayer shawl) reads the memory of Rabbi Alexander Goode. At the conclusion of the ceremony at Stafford Post 290, guests were provided wonderful refreshments by Auxiliary Unit 290. As with the many other Posts throughout Virginia, those blessed to have an Auxiliary Unit saw many of them assisting with the decorations, ceremonies, and serving of refreshments after the services. This is truly a Legion Family event and we are proud of all of our Posts who took the time to remember the Four Chaplains.